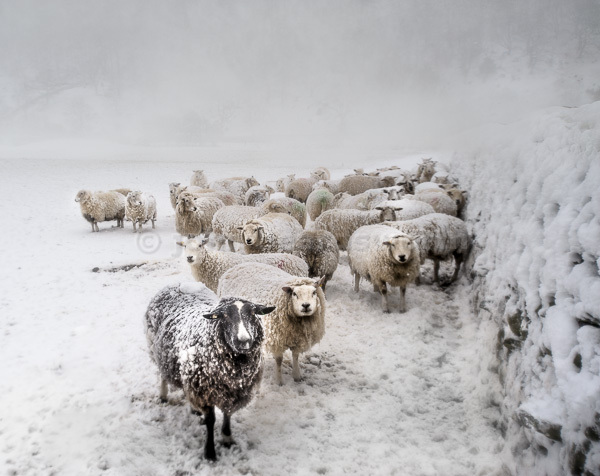 I’ve joked that if Lightroom had been invented in the Lake District, its dust spotting feature would have been called the sheep removal tool. I’ve nothing against them, and they can enhance a picture, but I’m convinced they do their best to frustrate the photographer. If you ever want them to use them as part of your composition, you’ll find they scatter the moment they see you, or they have a way of standing that makes them look three-legged or headless. But this was different. This was taken in late March in the Langstrath Valley. 8″ or 25cm of snow had fallen overnight and I was happy as the proverbial pig in muck! I’d already done one circuit and the snow was starting again, so I was on my way to a barn further up the valley when I came across this group who had found the only shelter from the wind. Most of all I loved how the only black one seems to be their leader. No way was she going to move for any photographer.